"The one absolutely unselfish friend that man can have in this selfish world, the one that never deserts him, the one that never proves ungrateful or treacherous, is his dog." --George Graham Vest, "Eulogy on the dog"
"They are your friend, your partner, your defender your dog. You are their life, their love, their leader. They will be yours, faithful and true, to the last beat of their heart. You owe it to them to be worthy of such devotion." The best private sector canine detection services are privately contracted, confidential and do not involve the police. These services alert families, businesses and schools of potential problems so they can be dealt with before law enforcement is involved. After years of service, our reliable canines have retired. Our state regulations and insurance costs have made it cost prohibitive to provide canine detection services to individuals at this time. We remain available for consultation. 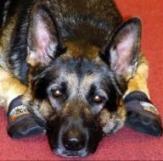 We still provide information about canine detection and related family issues such as substance abuse on this web site. 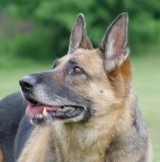 We love German Shepherd Dogs and encourage German Shepherd Rescue, talk about Health and Illnesses of dogs, we have Poems and Tributes and ways to purchase books and equipment. Enjoy our website! Click here to contact us.